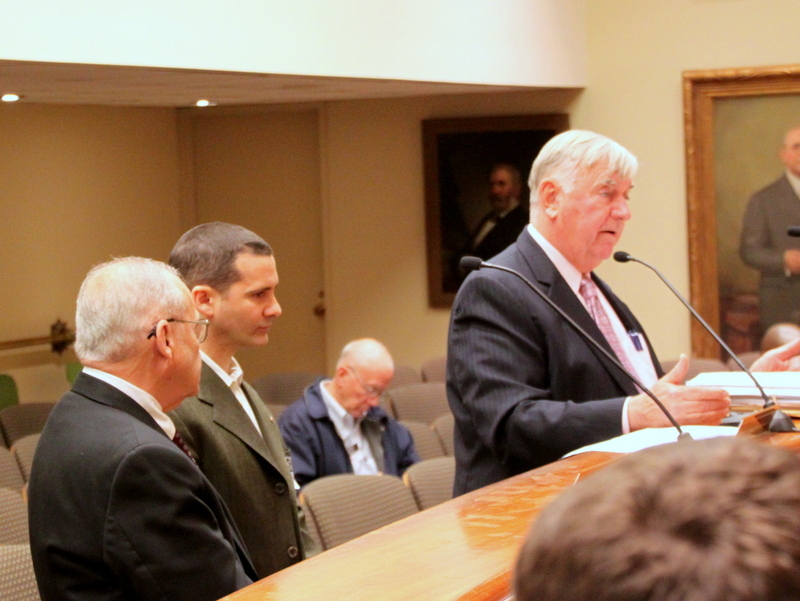 Above: Ian Parrish, center, listens as Mel Kodenski addresses the liquor board. Affirming that it will continue, despite some early inconsistencies, to enforce the law that says liquor licenses unused for 180 days are dead, the Liquor Board yesterday killed the license for the Baltimore Eagle, which closed in 2012. “It is very clear to us. . . that the 180-day rule in this case has been violated,” Chairman Thomas Ward said, informing Ian Parrish that his request to have the license for the establishment at 2022 North Charles Street transferred to him was denied because the license had expired. Parrish’s lawyer, Melvin J. Kodenski, had argued that a strict interpretation of the rule was not proper and noted that in the past, the liquor board might allow a license to live if, say, a use and occupancy permit wasn’t granted until the 185th day. But Ward said they are sticking to the rule without exceptions, despite past instances in which the commissioners had not done so. “I agree with you in the past there have been some inconsistencies, including some by this very board, but not since we had Senator Della’s testimony,” Ward said. Ward was referring to last September’s testimony by former state Sen. George Della, the sponsor of the legislation in 2000 that established the 180-day cut-off as a way to reduce the glut of liquor licenses that were seen as a plague on a city with shrinking population. Did the board turn a corner after Della’s appearance? Yes, said Community Law Center lawyer Rebecca Lundberg Witt, whose weekly watchdog blogging about the Liquor Board hearings dates back to before Ward became chairman in June. “They really have not misinterpreted or failed to follow” the 180-day law since then, Witt said, speaking with The Brew after the hearing. It was cold comfort to Parrish and his group, which included about a dozen people in the audience who came out to support him. Parrish has said he wants to revive the venerable North Baltimore gay bar, but testified last month that he has been slowed down by unanticipated problems with bringing the dilapidated building up to code. After the unanimous ruling by the three-member board, Parrish and his supporters declined comment. But Christopher S. Willoughby, an advisor to the Parrish family, blew up outside the hearing room. “There are 500 bad laws in Baltimore city and they chose to enforce the one that punishes people who want to invest in the city,” Willoughby said. Della’s appearance before the board took place on the heels of months of controversy over several rulings by the board (and many by the previous board under Chairman Stephan W. Fogleman) that the Law Center said ignored the 180-day rule. When Della came before the board, it was on behalf of opponents of one of the most high-profile zombies then staggering around the city – the one the promoters of Crossbar in Federal Hill sought to use. Since then, attorneys for licensees seeking to oppose Ward’s rulings have focused on other alleged inconsistencies as a strategy. At yesterday’s proceedings, there was little direct reference to the community association turf battle the Baltimore Eagle case exposed in March. The Old Goucher Community Association (which supported a transfer for the Eagle) and the Charles North Community Association (which opposed it) both laid claim to the dreary block on North Charles Street where the onetime lively leather bar now sits vacant. 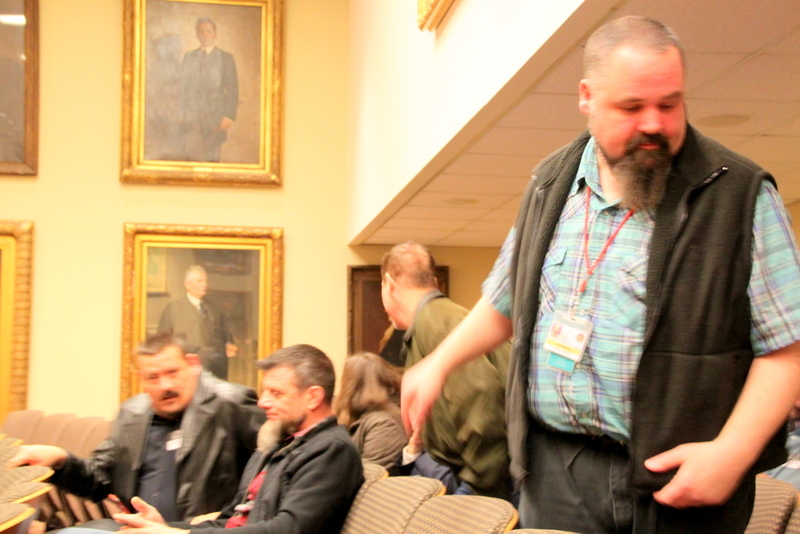 The only oblique reference to tensions among Old Goucher, Charles North and their allies from the Charles Village Civic Association came when Kodenski asked Commissioner Dana Petersen Moore to recuse herself. Moore’s comment in a previous Brew story about the case, Kodenski said, had been improper. Moore said her Brew comment – pointing out in reference to the 200-foot rule that Ward had rejected it as one of his first official acts – was not relevant to the core issues at hand in the Eagle case. The commission voted unanimously to deny Kodenski’s motion.